I come from a small town, a town that in places across the US is disappearing, getting swallowed up by bigger cities, a faster pace. I come from a place where everyone knows your name and everyone cares about how you’re doing. This small town of only 322 people has come a long ways, while at the same time never leaving behind where it has been. It has memories of incredible people, people who fought to keep this small American town alive and prospering. You can tell in our faces who has been here their whole lives, and those that haven’t still take pride in what we have here. We know it’s rare, we know it’s sacred and we know we’re so very lucky. This coming weekend is a special time for this small little farming town that sits south of Portland only 30 miles. 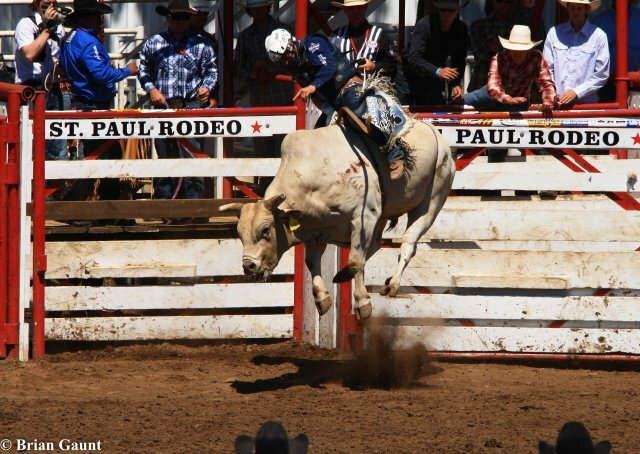 It’s St. Paul Rodeo time folks, and it has come to town. It promises bucking bulls, dirt flying, cowboy boots, carnival rides, elephant ears, snow cones, and beer. It takes an army to run this event, but we do it year and year again because I think it’s just in our blood to do so. We all volunteer; make time to invite people in to our little hideaway, just for a few days. 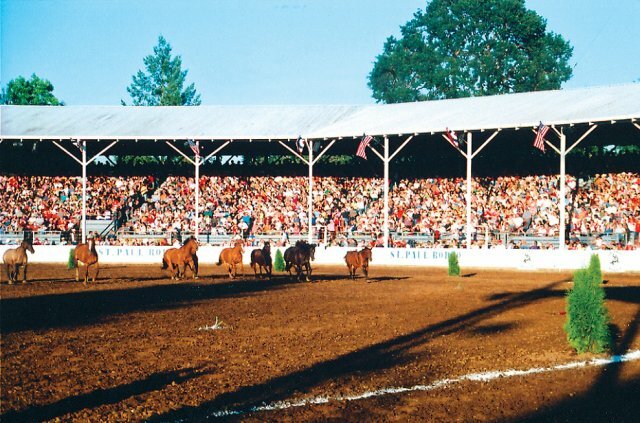 The St. Paul Rodeo is the biggest west of the Mississippi on the 4th of July and brings in over 60,000 people every year! That’s quite a bit for small town of our size! People pile in with their pick-ups and boots, parking in make shift parking lots to raise money for the high school booster club. Excitement is in the air, and you can feel it, because the rodeo is here! Bulls and Barrels promise to be exhilarating and the beer promises to be cold. I found this piece in a book awhile back and I truly can’t say it any better than this…. In the grassy parking lot, near the entrance to the fairgrounds, pickups outnumber cars. There isn’t a BMW in the bunch. Bumper sticker proclaim “Eat Beef” and “Ranchers Are the Real Endangered Species.” They climb the grandstands before the cowboys arrive. They sit among neighbors, and look around for a hand to shake, a back to slap, an elbow to squeeze. Their smiles are unwilted in the heat. We’re still here. A tiny loudspeaker blares a country song, and cowboy hats bob to the rhythm. An American flag snaps in the breeze. 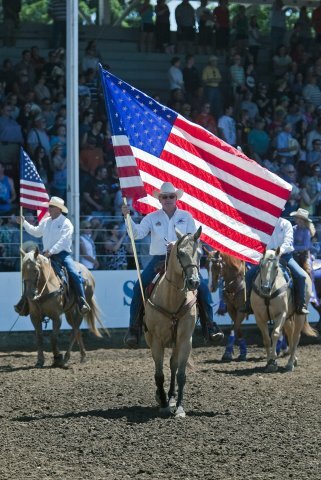 The announcer salutes the cowboys, salutes the crowd, salutes every brave American who has fought and died. In the flourish of the Grand Entry, the men and women of rodeo burst into the arena with the hoof-pounding thunder of a posse sweeping over the ridge, racing to the rescue. The smiling, blushing rodeo queen, wearing a sequined blouse, tight jeans and boots, waves to the crowd with a white-gloved hand. Rodeo clowns, wearing baggy trousers and coats of greasepaint, turn somersaults for the children, who giggle their father’s shoulders, as happy as life can be. We’re still here. A cowboy comes flying out of the chutes. The crowd groans and gasps with every twist and turn, as if each one of them is taking the wild ride. The people of the plains know the danger of a sudden jolt, the fear of slipping from the edge. The horse darts to the west, then to the east, and rears back in the fury. The cowboy holds tight, summoning every ounce of strength he can muster. The crowd is right there with him. “You can ride ’em,” they cry. “Ride ’em! Ride ’em! Ride ’em!” The cowboy hangs tough, outlasting the challenge, landing on his feet. A roar of triumph sweeps the grandstands. We’re still here. Brenda, simply put… well said! Great photos too!!! 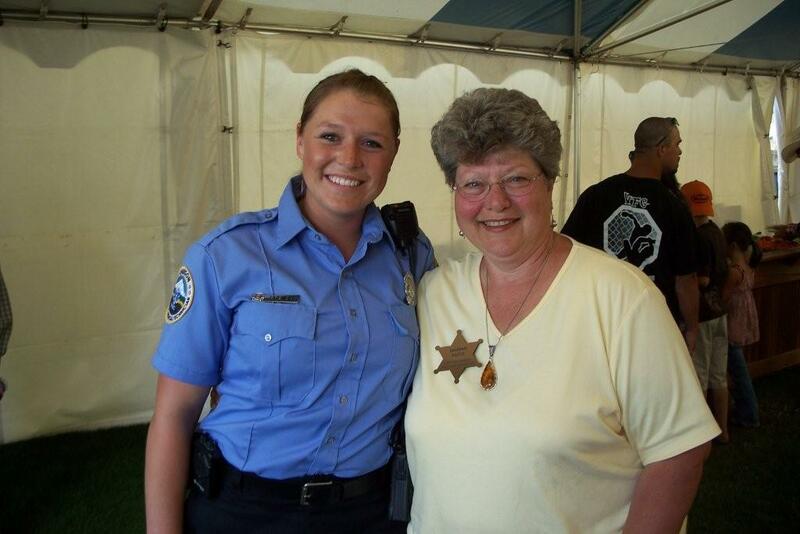 Hope the Rodeo is a success and you have a great weekend. I really like your opening paragraph about small towns. Thanks Robyn! I’m sure you can tell I’m excited about it 🙂 Hope you have a wonderful 4th of July too!! !